Successful music theatre auditions require preparation and a great audition book. In this blog post, I tell you how to build your audition book, where to source the equipment and what songs to put in it. Landing any performing role (both professional and amateur) requires you to nail an audition! Sometimes, opportunities come at you from out of the blue and you have to be ready quickly to demonstrate your stuff! There are so many aspects of an audition that are out of your control, but the preparation of your music is not one of these! Good performers don’t just find a new song for every audition that comes up. Instead, they work between auditions ensuring they are ready to audition at any moment and that they have a selection of songs on hand that show off their abilities as vocalists and actors. An audition book is a way of organising your work and is standard practice in the industry. In fact, many actors simply refer to it as “the book” and directors might ask you what else you have in “your book”. A well-organised audition book demonstrates to a casting panel that you are a serious performer who works at your craft. What goes in your book? A copy of the sheet music prepared specifically for your accompanist. An index page that you update to reflect the contents of the book. Staying on top of the repertoire in your book is important. You could be asked to sing any song you bring with you into an audition at the drop of a hat. If a casting director isn’t hearing what they need from you, they might ask you what else you have brought. For this reason you want your book to cover a lot of bases and demonstrate various styles/genres of musical theatre repertoire. As well as your songs, you will want to keep copies of your head shot and resumé in your audition book. Organised: You need to be able to put your hand on a song quickly if you are asked for something specific on the spot in an audition situation. From trial and error, I recommend you use a 3-ring insert binder and some plastic pockets (sheet protectors). A 3-ring binder is the easiest format for page turns while still remaining durable. Spend a little extra and buy the heavy-weight or presentation quality sheet protectors. If you want an extra touch of pizzazz, you can use some divider tabs to organise your content. Traditional Ballad: A slow romantic or expressive song from a traditional or book musical (pre 1960s – Roger’s & Hamerstein, Rogers & Hart, Cole Porter). Comedic or Novelty: a song that stands out because it is funny, fast, quirky, super high or low, has character voices, or demonstrates some special skill you have. Your own choice: Something that shows who you are as an artist and represents your musical interests. This could be an original. Country: If you select well, country songs can be tremendous story-telling songs. 50/60s song: Choose something uptempo (Hairspray, Bye Bye Birdie, Mowtown era, Otis Redding, Marvin Gaye). Disney: Disney stage musicals are some of the highest grossing of all time. Choose one of the early and less-performed Disney songs. Operetta or Art Song: Something that demonstrates your vocal range, legit singing (Gilbert & Sullivan, Franz Lehar, Sigmund Romberg, Victor Herbert, The Merry Widow, The Desert Song, The Student Prince). A 32 bar version (approximately one minute performance time). A 16 bar version (about 30 seconds). When you cut down a song, think very carefully about flow, tying to ensure that you eliminate unnecessary parts (such as long introductions and repeats). The song still should retain a sense of development and a climax point and suitable ending. In this short video, Michael demonstrates what’s in his audition book and how he set it up. Copy your music carefully: Most sheet music books are slightly larger than standard copy sizes. Ensure that no important information is cut off when making page copies. Repeats: Generally you will want to avoid performing repeats of song sections in an audition. However, ensure that any repeats, codas are clearly marked on your music so that the accompanist (who may not know your music) can easily follow. Consider copying extra pages and organising your music so that the accompanist does not have to do too many page turns and risk getting lost. Overdone songs: there are many urban myths about what sorts of songs you shouldn’t do in an audition, but you should try to avoid putting songs into your book that are overdone and therefore not likely to impress a casting panel. Music cuts: When constructing your shortened (16-bar versions of songs) make sure your music cuts are clearly marked, including what sort of introduction and ending you want. Missing information: Ensure the title, show, tempo, style (such as Swing) and composer/lyricist are written at the top of the page – important if you’ve made cuts resulting in this information being left off. 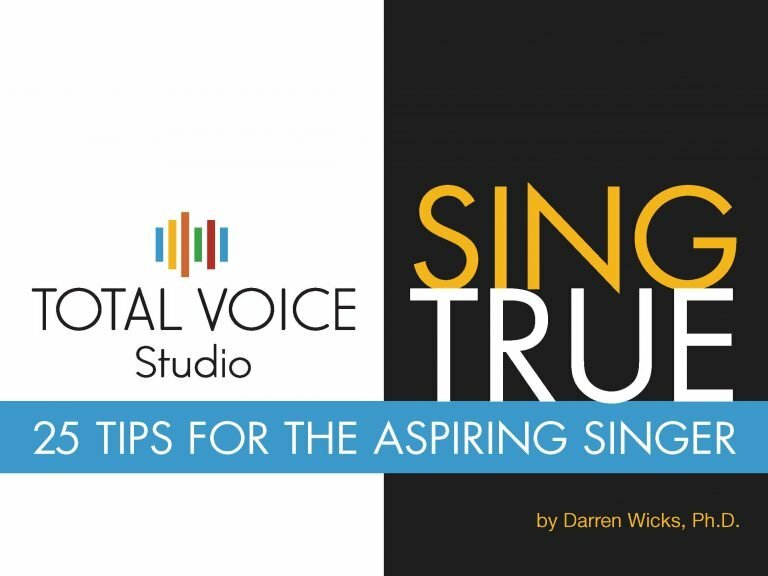 Dr. Darren Wicks is the founder of Total Voice Studio. He is a voice educator, jazz pianist and choral conductor. Darren is passionate about working with singers and mentoring teachers. With a career spanning 25 years, Darren brings a wealth of knowledge and experience to his teaching. His experience includes work as a high school music teacher; a university lecturer, work with community music groups; studio teaching; school and community choirs; amateur musical theatre and teacher education. No spam and 100% privacy. I promise! © 2018 DR. DARREN WICKS.| TOTAL VOICE STUDIO | All rights reserved.